When adjusting your timing in the Timeline and Exposure Sheet views, you may want to set some preferences. This section covers the preference related to the timing measurement. ‣ Mac OS X: Select Toon Boom Studio 8.0 > Preferences. The Time Measurement preference is on the Interface tab. It is used to change the way the timing measurement is displayed in the Timeline and Exposure Sheet view. 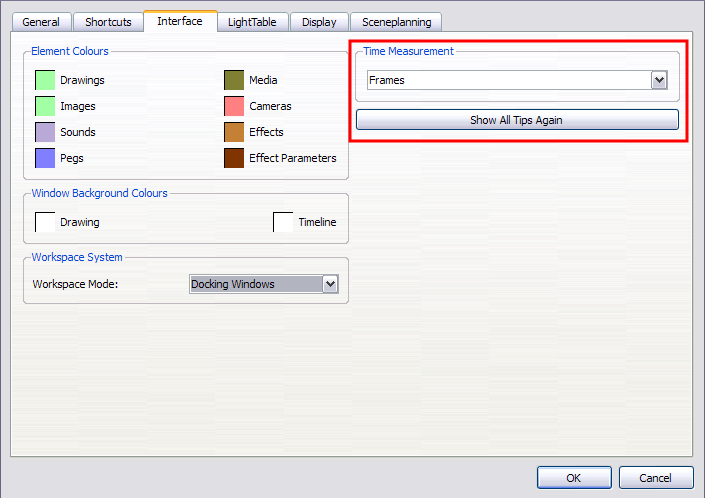 ‣ In the Time Measurement drop-down menu, select Frames or Feet and Frames and click OK.
Frames: The animation timing is measured in frames per second. To get a fluid animation, you need a minimum of 12 frames per second. This technique is frequently used when working with a software. Feet and Frames: This technique is mainly used when shooting the animation frame-by-frame directly on film. The length of the animation is calculated in length of film instead of frames per second.